Virtually no research project of interest that includes in silico analysis only uses a single software tool, operating on a single data set, under a single set of parameters. There will be iterations over data sets, sweeps over parameter ranges, and multiple software tools will be used. These are all operations whose reproducibility is every bit as vital as that of a wet lab procedure. Therefore, the haphazard and manual chaining together of computational analyses is a recipe for failure. In addition, because research is usually exploratory such that the right approach only becomes clear after many failed attempts ("everything you do, you will probably have to do over again"), manual repetition becomes boring and error prone. 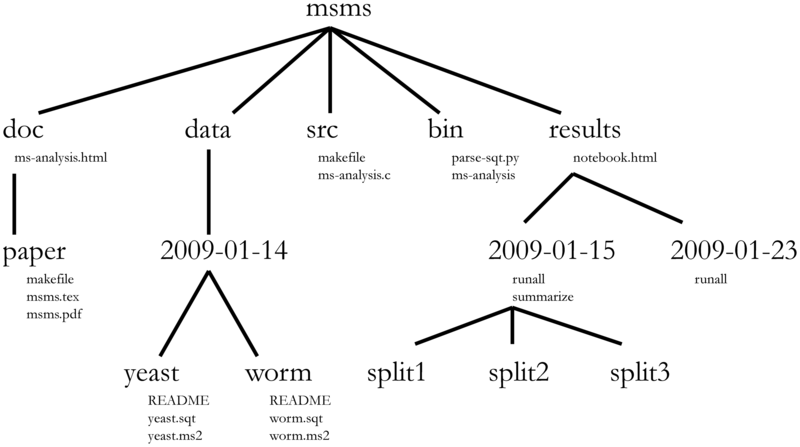 Hence, computational analysis should be viewed and organised as a workflow that is automated as much as possible so that it can be re-run at will and shared with collaborators as well as the wides research community. Here we will consider some of the practical approaches and considerations in developing computational analysis workflows. Some of these folder names match those in UNIX-like operating systems (such as Linux) and play roughly the same role. This is, of course, no coincidence - but rather a mnemonic aid. To read more about the reasoning underlying this project structure, consult [Noble2009] (where this layout came from). shell scripting - on most operating systems (also on Windows), programs can be invoked on the command line shell, and these same invocations can be stored in a text file that can thus execute a series of program operations automatically. On many operating systems, shell programming is flexible enough to accommodate simple conditionals ("do this if that is true") and loops ("do this for all files"), which could easily be all you need if all the complex logic is encapsulated with the software tools you are using. A very good guide for shell scripting on OSX and UNIX-like operating systems is here. make tools - one step up in terms of syntax is to use tools like make). Originally developed for compiling software, make (and tools like it) also issue invocations on the command line, but they are more intelligent in handling dependencies between steps (i.e. step B can only be invoked if step A has completed successfully) and allow you to label intermediate steps so that you can run a specific command defined somewhere in a larger input file for make, called a Makefile. This allows you to work incrementally, so that the output of one step can be checked before moving on to the next. scripting languages - a number of open source, general purpose scripting languages exist that can both invoke other programs on the command line, and do complex operations on data themselves. These languages include Python, Perl and Ruby. More domain specific and originally geared towards statistics is the R programming language, which can also be used to chain software tools together. Although these languages are a departure from familiar command line syntax, they are extremely flexible, well documented, and have large, helpful user bases. It is a very useful skill to pick up at least one of them. literate programming environments - as discussed in more detail in the section on scientific software, several environments exist that allow you to mix prose, visualisations and programming logic. Although these are more specialised tools as opposed to general scripting languages, the ability to document workflow logic in prose, operate incrementally and include visualisations is extremely useful. 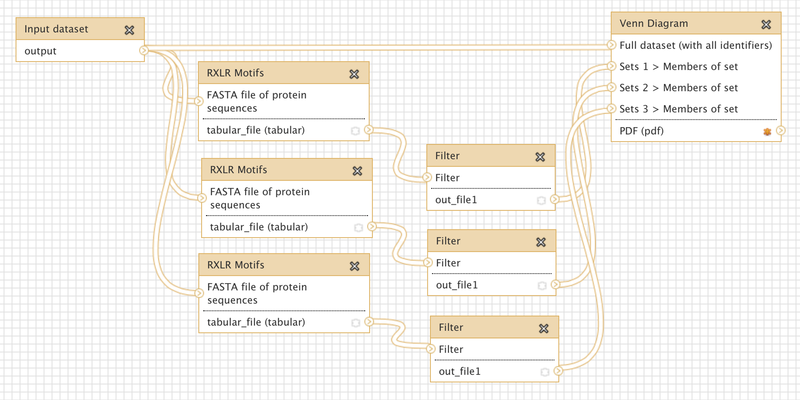 visual workflow tools - touted as a way to build complex computational analysis workflows without having to write any code, several visual workflow tools are also available. Example 2 shows the visual workflow interface of Galaxy. The advantage of these tools is that, indeed, analysis steps can be enacted with mouse clicks. The disadvantage is that to enable this kind of "button-press bioinformatics", the underlying code to make the right invocations still needs to be written by someone, so these tools are not very flexible or innovative. They are very good for standard operating procedures in labs, but not as much for novel research. virtualisation - computers have grown powerful enough, and software emulation clever enough, that one or more operating systems can be run inside another: virtualisation. Using such technology, workflow developers can start from a fresh, virtualised operating system, install the entire workflow and all its dependencies on it, and then package and distributed that virtualised operating system as a disk image. The result is a rather large file (because it is an entire OS) that users can launch on their local computers as a virtual machine using tools such as VirtualBox or VMWare, or "in the cloud", e.g. on an installation of openstack maintained by an institution or at a commercial provider of cloud computing such as AWS. containerisation - a more lightweight solution for bundling tools that are otherwise difficult to install is offered by "containerisation". Here, the idea is that a lot of the standard components bundled in a virtual machine are actually redundant because the host operating system within which the virtual machine is run has these components as well. Hence, a more lightweight solution can be arrived at by only packaging the non-standard components of a workflow environment into a "container", e.g. as implemented in Docker. Note, however, that there has to be tighter relationship between the host operating system and the container (because they share more components), so this approach works best on Linux hosts. Also, there is more potential for security risks than with virtual machines, so providers of compute power (such as, for example, your institutional system administrator) might be less keen to support containers. provisioning - another solution to dependency management is to define all the dependencies and the steps to their installation in a script. For example, the SUPERSMART pipeline uses a puppet script to install all the dependencies.